Through a combination of stable technology, dedicated technicians and, resistance to random outages, the Internet has been resilient to attacks on a day-to-day basis, creating an extended period of prosperity. Yet, as we approach nearly absolute dependence on the Internet, cyber attacks of the future can and will affect globally interconnected systems like electrical grids and worldwide logistics systems. This Internet of tomorrow will be a source of global shocks for which risk managers, corporate executives, board directors, and government officials are not prepared. At the onset of the Arab Spring, then-Secretary of State Hillary Clinton warned that the foundations of the Middle East risked “sinking into the sand” of unrest and extremism. Three years later, the region is still in a period of prolonged tumult and uncertainty. A large youth bulge, poor economic prospects, and uneven development across the region presents significant challenges to a more stable Middle East, but, more positively, the next five to ten years could see a reintroduction of Iran to the international community and a new regional dynamic if the ongoing P5+1 talks reach a lasting nuclear agreement. What is certain is that the future of the Middle East will have profound effects globally and will continue to substantially influence the global political, economic, and security environment. In his latest report, “Middle East 2020: Shaped By or Shaper of Global Trends,” Mathew Burrows, director of the Strategic Foresight Initiative in the Brent Scowcroft Center on International Security, addresses the possible medium- and long-term consequences of the ongoing developments in the region and the various factors driving the monumental changes. The report explores three alternative futures: one optimistic, in which relations among powerbrokers in the region turn a corner for the better, and two more pessimistic scenarios-fragmentation and decreasing state authority or the emergence of a new authoritarianism. The Atlantic Council’s 2012 report Envisioning 2030: US Strategy in a Post-Western World, written as a companion piece with the US National Intelligence Council’s Global Trends 2030: Alternative Worlds, stated, “the keystone of national power remains US economic strength and innovation.” Building upon this statement, this year’s Envisioning 2030: US Strategy for the Coming Technology Revolution, edited by Strategic Foresight Initiative Director Mathew J. Burrows, explores the consequences of major disruptions that will be caused by emerging technologies and recommends that the United States must prepare now if it wants to remain competitive on the global stage. Offered as a companion to the US National Intelligence Council (NIC)'s Global Trends 2030 quadrennial assessment released today, the Council's Envisioning 2030: US Strategy for a Post-Western World surveys the emerging economic and geopolitical landscape; it describes the unprecedented policy challenges that landscape presents; and it outlines a US strategy to avoid a zero-sum, conflictual future and move toward a more cooperative and prosperous 2030. 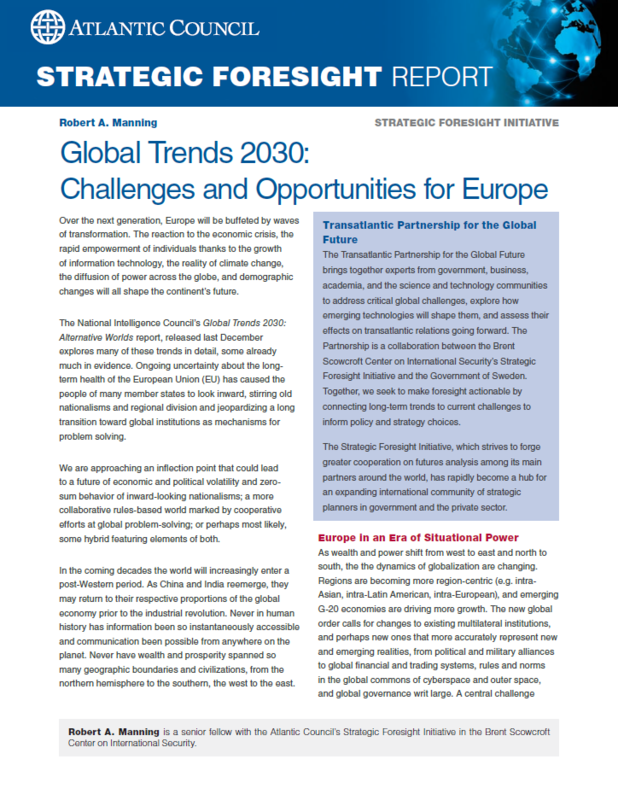 This report was written for the Transatlantic Partnership for the Global Future, a project organized in cooperation with the Government of Sweden, to bring together experts from government, business, and academia to address critical questions relating emerging technologies to global challenges and explore their effects on transatlantic relations in the near- and long-term. Over the next generation, Europe will be buffeted by waves of transformation. The reaction to the economic crisis, the rapid empowerment of individuals thanks to the growth of information technology, the reality of climate change, the diffusion of power across the globe, and demographic changes will shape the continent’s future. We are approaching an inflection point that could lead to a future of economic and political volatility and zero-sum behavior of inward-looking nationalisms; a more collaborative rules based world marked by cooperative efforts at global problem-solving; or perhaps most likely, some hybrid featuring elements of both. Tailored to address the distinct challenges Europe faces, this report draws upon the US National Intelligence Council’s Global Trends 2030: Alternative Worlds and provides further, in-depth analysis on the policy priorities and opportunities for Europe in the future.